He had known it. He had not dared to admit it, not even to himself, but he had known all along. Even while he was caught up in the treacherous black of Moag, he could sense the woman, believing she had put some queer curse on him, tweaked with his mind somehow. Half the reason he was determined never to mention it to anyone was because he was afraid of having it confirmed. Well, now it was confirmed. Noel turned away, hands held out in front of him prepared to plead with the universe, but the irony struck him like a fist in the gut. He had already done his pleading. Going off to Arnhem Land, drinking poisonous potions to commune with the Dreaming— pleading with the universe was precisely what had caused all of this in the first place, he thought, shaking his head at the numb burn in the tips of his fingers, a thousand sensations there in the bundles of nerves, none of which belonged to him. How could he explain this to Phileas and the others, without coming off as a loon at best or an inept dolt at worst—not that he was ever getting out of here to explain, he reminded himself. But the Mardraim took his arm once more and ushered him quickly across the room. “We will speak no more here, for we must hurry. The rains will end soon, and we must be well away from here before they do,” the elder said, as he pulled a bottle of dirt from the sleeve of his robes, paying no mind to Noel’s confusion or his concerns about actually being possessed and what that might mean for the quality of his life the next hundred years or so. Kneeling by Noel’s things, the old man tugged the stopper from the bottle and poured its contents out into a mound in the middle of Noel’s blanket. “Yes, yes. I need your essence, there in the dirt, please,” he nodded, pointing to the mess he made. “My essence?” Noel choked over the word. “Your essence,” the elder replied, then realizing there was some confusion over the meaning of the word, he spat twice at the floor and waved his hand, indicating Noel should do the same. Shaking his head, Noel complied, landing a large glob of slobber right on the top of the pile, which hissed and bubbled up quickly into a frothy foam. The Mardraim pulled a slender twig of birch out of thin air and began to chant a strange incantation in a low voice, as he stirred the boiling muck. Every third turn, the substance grew a deeper shade of crimson, and he delivered a new verse, writing in the mixture symbols that looked like some ancient form of the wizened language, though Noel had never studied the tongue. All the dirt incorporated, the substance, now a dark, rubbery brown, the old man stopped his work, and the blob of gloop began to undulate and grow of its own volition. It grew eyeballs that squirmed to see, looking this way and that but never quite in the same direction, as their perched atop a pile of gray matter, a lung and intestines. It grew a puss-like mass that slowly turned to sickly white flesh, formless and squirming. It grew an arm and then legs, ribs and a mass of curly brown hair. It grew a mouth that gaped open, tongue lolling free between familiar crooked teeth as eyes found their place in holes in the flesh, spinning round on themselves as the torso was complete, arms and legs came to right, and finally the skull took shape as the growth came to its feet. Noel stood amazed, facing himself, grinning mortified at the dumbfounded look on his naked doppleganger’s face, as Edward Frank handed the thing fresh garments. “How did you…?” his twin said, sounding as mightily impressed as Noel himself. There was a lot to be impressed with, exactness of the golem aside, starting with the fact it spoke in almost complete sentences and sounded as idiotic in its lack of knowledge of the ancient Elfin tongue as the real Noel did, which was both a comfort and more than a little disconcerting. “Yes, how did you?” the real Noel whispered to the Mardraim as the creature dressed. He had seen a golem before, but not one so very real, never one so very… Noel. “This is a confluence, a coming together of Fahmat, like the rains here in the mountain. The earthen one is formed, brought to existence by an ancient work of the Adon. Mm, you call them the Wizened, I believe,” the old man answered. “Wizards,” both Noels nodded, then eyed one another uncomfortably as they each rubbed an anxious hand through the back of his hair. “Gods,” his mirror nudged him. “-created the charm for instilling in him quick thinking. Of course, a thinking, feeling, being without a soul can be dangerous. This one we have no need to worry over, as he is not going anywhere, and we shall return him to the dust where he belongs, as soon as we arrive back home.” The fact the golem had no soul was at least a small comfort, Noel thought as the elder flicked his wrist and in his palm blossomed a murky blue haze. “Breathe deep, please,” he added, holding his hand under golem-Noel’s nose. “We go?” Noel asked as the golem breathed the toxic-looking fumes. “I don’t feel so well,” golem-Noel said, his English as perfect as his Elvish was not, as though he’d been raised right alongside the real Noel in his High Wycombe home, though he clutched at his throat as his voice rasped, and he sniffed greatly against a suddenly runny nose. “I think the old bugger’s struck me with a flu.” He placed a hand on his own forehead, as the real Noel wondered that the man of clay was so real he could actually take ill. He had always thought of golems as bumbling monsters, not at all human, but then he had never seen anything as remarkable as the creature presently crawling between the covers, atop which he had so recently been brought into existence. If he was actually human, soulless or not, would returning him to the dirt, as the Mardraim suggested, constitute murder? If Noel took part in doing in his newfound twin, would it be considered some backwards form of suicide or would it be more like cutting a cancer from the world? “No visitors,” the golem agreed, sneezed three times in succession, then swore in a voice that sounded much like Noel’s father. “The illness is necessary, to keep others away. And now—” The Mardraim raised his hands toward Noel’s chest. “Wait! What?” Noel breathed, taking a hurried step back. He had not realized until that moment of panic that his arms and legs were stiff with shock and his hands were trembling, but then he had just watched the old man turn a handful of dirt and a bit of Noel’s slobber into a walking, talking, breathing, thinking, illness-catching copy of himself that they were going to kill as soon as they returned from wherever they were going. The golem even possessed Noel’s mannerisms. Noel certainly was not going to let Edward Frank do anything to him without some discussion of the matter. “Light well? What light well?” Noel demanded. “A bending of the light around you. What do you call this today?” he looked to the golem, but the other Noel was busy whinging and moaning, blanket pulled up around his ears, shiny new teeth chattering. Edward raised his hands again, but this time Noel jumped backward, holding up fists in defense, though he doubted they would provide much protection, when the fact of the matter was even the magic Noel knew— and to be fair, he knew rather a lot as elves went— was no match for the extraordinary power he had just witnessed. By now he understood the mountain people had exceptional skills, he had been keeping notes of the things he had seen, in case he ever managed to make it out of there, but Edward Frank, with his knowledge of the magic of so many races, was easily the greatest magician he had ever met, greater than both Footes, Bergfalk and Henry Frifogel combined. “I have no name for light well. I no know bending light,” Noel answered, slightly bothered by the fact the Mardraim had asked the golem. “No Ken knows, Master Frank. No Ken,” Noel answered, shaking his head. The old man was talking about making him invisible. If anyone knew how to do this, the Nobles would have been taught. All this time, Bergfalk and the elder Foote thought they were preparing their people for a war that was inevitable, the Great War of the races that would continue with the birth of the Last Hope of the Elves and the opening of the gates, as prophesied. The wizards’ fate might have been imprisonment in the ice, all these years, as their punishment for the near destruction of the elfin race, but as far as anyone knew, they had not been subjected to ten millennia of thinning bloodlines and a catastrophic loss of knowledge and ability of their kind. The more Noel saw the work of the mountain people, the feebler the elves seemed in comparison, the more certain he grew that the impending war was one the elves were always destined to lose, that truly the child, their Hope, would be their last hopeless breath in a world where they no longer had a place, like giants and dragons, just as he had secretly feared for so long. With her birth and subsequent death in the ensuing carnage, his brothers would become the stuff fantasy, elfinkind surrendered forevermore to the realm of mythological beings. They would be lost. But that was a ridiculous idea, especially when he had just agreed to help the Mardraim restore whatever destinies he had already broken in coming there. The old man had said Noel was somehow responsible for the changes in their destinies, but that did not mean he would ever have any control over how they changed. No, if the prophecy in the Book of Ages was true, and Noel had not managed to completely destroy it with his trip into the Dreaming and his subsequent jaunt through Moag, it was more important than ever that he find some means of escaping the mountain. He had to learn what he could of the magic of all people while he was there, he had to learn how the people of the mountain blend the various abilities together in these confluences, as the elder called them, to create such spectacular works Bergfalk and Foote had never imagined, and he had to warn the Nobles and the Seat that the elves would be no match for the wizards without significantly more training. They were undermanned and overpowered. They had lost far too much knowledge in the Fall. The elder’s scowl deepened, as he folded his hands together, making a steeple of his fingers. “Not one of your people knows how to bend light, Noel Loveridge?” he said, his mouth settling into a shameful frown. Noel gave a small shake of his head and quickly added, “The rains, Master Frank. We go.” He did not want to talk about it. He wanted to get on with this, so he could fix things, turn it right and move on. “Yes, we go, but I sense in you a great loss, Ohamet,” the old man said, somber eyes watching Noel carefully. One could hardly lose what one never possessed, Noel thought, clenching his teeth against the painful thumping in his chest. He would learn what he could, and return home, even if he had to make his way back out through Moag to do it. He owed his brothers that much, he thought as he lowered his hands to his sides at last, nodding for the old Master to continue. Edward stared at him for long minute before at last giving a heavy sigh, taking in a deep breath, and with a swift motion, plucking something from the air a few inches from Noel’s chest. Hands shaking, either with age or in his struggle to keep hold of whatever it was captured between his fingers, he dug brittle, yellowing nails into the tiny sliver of space between his thumb and forefinger and drew out something invisible to the naked eye, pinched between his nails. Tongue poking out from between his teeth, he dug in the nails of his other hand and began to twist back and forth, to pry the imperceptible thing apart. Soon his whole body began to shudder with the effort, his face turning first red, then white, a bead of sweat forming on his crumpled brow. Noel was about to ask if he could be of assistance, but as he made to speak, a wry smile spread across the old man’s cheeks, and with a sharp crack that made Noel’s ears pop, Edward’s fingers broke free, and he laughed at the look on Noel’s face, as he stood there stunned, finger jabbed deep into his right ear, frozen in mid-wriggle. Noel watched in awe while the old man drew his hands apart, and a slender filament of golden light stretched out before him. “What on earth…?” he stammered, reaching out his waxy finger. “Be still, Ohamet. Do not move,” Edward whispered, almost noiselessly, the fluctuation of his breath on the air exciting the filament, causing it to dance and shine wildly, as the old man’s eyes widened. Noel held his breath, as much out of amazement as to keep from ruining the incredible work he was witnessing. After a moment, the fragile strand of gossamer light settled into a gentle oscillation, and Edward carefully raised it above Noel’s head, bringing the tips of his fingers together to form a graceful ring. A snap of static and the faint hint of newly welded metal on the air indicated the ends had fused, and the elder let go, allowing the light to swim above Noel’s head like a halo, as he stretched and flexed his fingers in preparation for the next part. He took the ring by the sides and gently inched it larger, making it three times as broad around as Noel at the shoulders. The light danced chaotically in response, at one point coming dangerously close to Noel’s hair, before the magician touched it softly, here and there, lifting it tenderly back into place, until it was almost still. Satisfied, he pinched the filament between his fingernails again, and with much less effort than before, he forced the light to expand once more, this time drawing it down, so that the thin ring became a shining, luminous cylinder surrounding Noel with a pristine glow of energy. He pulled the base down so it hovered just above the ground, where it gave a small sizzle, then, with a childlike grin that caused his blue eyes to twinkle, Edward set the tube of light to spinning, and like a potter at work at his wheel, he urged the sides ever so delicately up and up, until the column of light extended all the way from the floor to slightly more than a foot above Noel’s head, where he drew the top together, and with a warm buzz and a zap, it sealed itself shut. “That will do,” Edward smiled, breathing a pleasurable sigh at his work that caused the dome of light to shiver and ripple with energetic colors before becoming still and crystal clear. It had almost completely disappeared, except in Noel’s periphery, where he could just make out the shroud of electric current surrounding him. “Is safe to move?” he hissed. Noel reached his hand out to touch the veil and watched the surrounding bubble shimmer as it extended out before him, always remaining several inches away from his flesh. “I see me?” he questioned. Edward reminded the golem that he was not to leave the hut or see anyone while they were away, then he and Noel set off, Noel’s anxious feet barely touching the earth as they started up the path toward the garden gate, where Emanuel waited. The rain fell slightly harder the nearer they came to the young man, and it was not until the elder began to speak in a constrained voice that Noel realized he was using the rain to conceal their conversation. Noel could not understand what the old man said to the boy, but from the look on Emanuel’s face as he glanced back at the hut with wide eyes, he imagined it likely involved something about golem-Noel’s illness along with instructions to keep watch over the hut the rest of the day, to warn away anyone who might come to visit. While he waited, Noel stretched his arms out wide and then way over head. Neither Emanuel nor Edward glanced in Noel’s direction. To be certain, he went to stand right next to the boy, stuck out his tongue, crossed his eyes and pulled on his ears. Still, he received no response. Clearly the light well did its job. The conversation finished, the elder led on in silence, Noel falling in step behind, wondering just how much knowledge his people had lost through the years. In their silence, Noel growing ever soggier as the rains slowed to a drizzle, then to a sprinkle, and finally to a stop. The two had traveled a long distance, well clear of the villages and fields where the mountain people toiled, when Edward finally spoke again. Noel gave a coarse grunt. He should be guarded, he knew. The old man twice presented him with pacts, first asking for help to get information about Moag from the Felimi, now claiming his own prophecies had been rendered null like Noel’s, hoping Noel would help him restore the path of Om, but kind as Edward Frank was, Noel had no reason to believe the elder was telling the truth, or that he had not just asked for help the first time in an attempt to get Noel to be more forthcoming with information at Fkat in the face of a Felimi, who had decided to hold him captive, and that this new agreement was not more of the same good-cop/bad-cop game that was being played by the people of the mountain all along. He was the Mardraim, after all—his loyalty was to his own people. Though Noel had determined he had a responsibility to ask the elder about the prophecies of Phileas and Wells, just to find out how much he may have affected the prophecies of others, he knew he would not tell anyone in the mountain about how he wound up in the Dreaming, and he was reluctant to share too much about his own people, out of fear there could be repercussions for them. Still, he was here, and if he wanted to keep things friendly, so that he could remain a guest of the Mardraim, learn what he could and have some chance of escaping eventually, instead of becoming a true prisoner at the hands of the Felimi, who he knew would never let him go, he had to be willing to give. “Long time past, there was … terrible… fight- a Great War of all people. All Ken died, save two, Aewin and Euriel. All Llendir come from these two. All known Fahmat come from these two. Fahmat of light was…” He paused, searching for the appropriate word. “Time after the Great War was much death… for all races. All beings… even beasts, were lost like Fahmat.” Noel did not possess enough knowledge of his people’s language to properly explain the cataclysm that followed the war or the intervention of fate and the punishment of the world, all races, each for their part in the destruction of the peace, once held in precarious balance by the stones of power. The Book of Ages could explain far better than he ever could, but the book told far too much of Eurial’s descendants, of Fendhaim and the Seat. “The foretelling I bring… It is of the Fall,” he added somberly. “Mm, I see,” the old man answered, and the two fell back into their silence once more, as the path they took cut into a more deeply wooded area, Noel wondering what his people had done so wrong, to deserve the harsh punishment they suffered the past ten thousand years. They were not the murderers. They were not the rapists or the thieves. The Father of the Elves had done everything within his power to uphold the peace. Noel swallowed against the lump of far too human truth that rose in his throat. No one could ever know just what Eilian did or did not do in the lead up to the Fall. All they had to go on were stories passed down through Aewin and Eurial over ten thousand plus years. Their historians would hardly have been the first to gloss over uglier facts in order to paint their heroes in a more favorable light. After a while, the trees parted, and Noel put thoughts of the Fall from his mind, as the horizon stretched out before them in breathtaking views from the precipice of the mountain looking out over a clear azure sky, and for a moment, he thought they had come to be outside by some magical means, while he was lost in thought. The view was truly exquisite, except for a slender mar of black that cut a deep and inexplicable gouge into the pristine blue, which Edward led them to now. 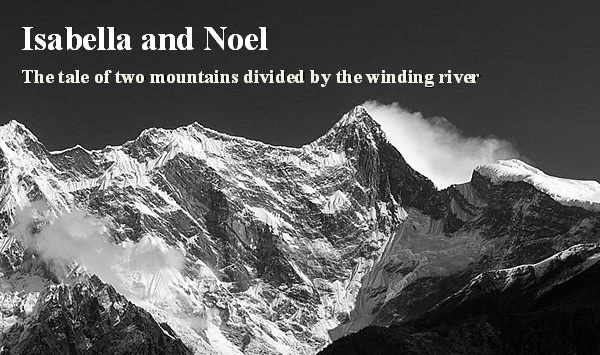 As the old man stepped into the crevasse, Noel paused, running his hand across the cold, rough heavens, somehow projected onto the mountain wall. “We must go,” Edward said, waiting for Noel to follow him into the tunnel. But as he stood at the entrance, Noel took in a stuttering breath. “Moag?” he said, the word barely escaping his lips. “I feel it,” he whispered, glad the old man could not see the fear that welled up inside him as he stood staring into the darkness. They were easily ten miles or more from the cloister, but Moag was definitely present here, though it felt nothing at all like the ominous void he knew waited for him, hidden at the home of the Felimi. “I do not wish upon you the torture that has struck such fear in the depths of your soul,” the old man added, reaching through the light well, resting a gentle hand on Noel’s shoulder. He had forgotten all about the old man’s empathy. “Thank you,” Noel answered quietly, slightly ashamed of himself that the fear came to him so easily, when he had not suffered nearly as greatly as Isabella Asan. Recalling the misery of her voice as she called out to him through the depths of Moag, he was struck by a terrible thought. “Isabella?” he whispered, pressing his fingertips into his palm, as though this might protect her, though he knew it would not. “You not show me?” Noel’s voice shook. “No. You must learn to feel the way, by strengthening your sense of Moag,” the elder answered.